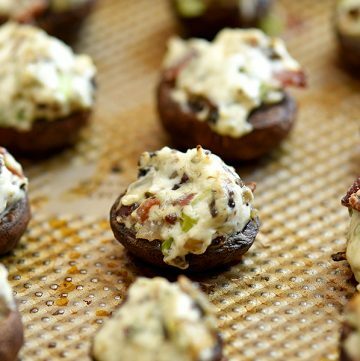 Bacon and Cream Cheese Stuffed Mushrooms are a must on any party menu! 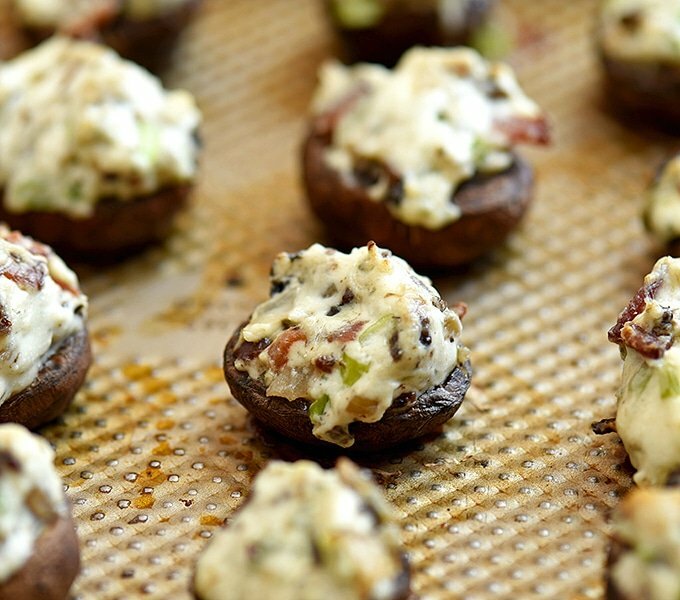 Loaded with creamy and smoky flavors, these delicious mushroom bites are seriously addicting! Looking for a quick and easy yet impressive and totally irresistible appetizer for your next get-together? 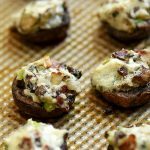 The stuffed mushroom recipe is for you! It’s simple to make with a short list of ingredients and comes together in 30 minutes. 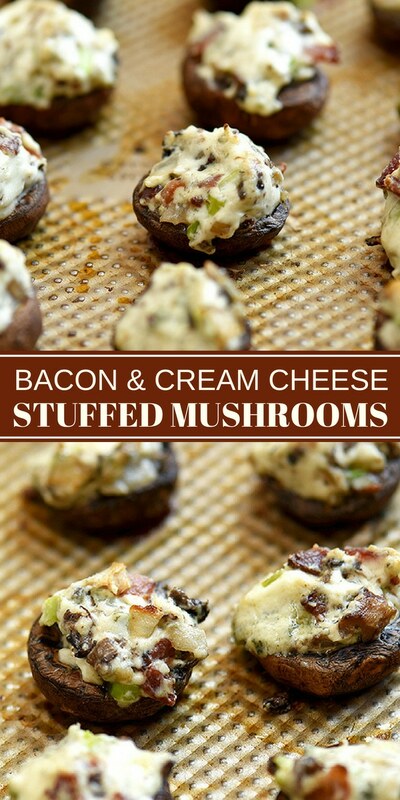 With juicy mushroom caps filled with a creamy cheese mixture, these delectable bites are a guaranteed party favorite. Have a big batch ready as they’ll go as fast as you make them! Mushrooms are like sponges and tend to absorb a lot of liquid. Don’t soak them as the excess moisture will deter proper browning when cooked. To clean and rid of dirt and grit, individually brush mushrooms with a soft-bristled brush or wipe with a damp cloth. Brushing or wiping each mushroom may not be practical when you’re doing a huge batch. To quickly and easily clean mushrooms, quickly rinse in a colander under cold, running water or briefly submerge in a large bowl of cold water. Drain the mushrooms well and pat dry with paper towels. I love the combo of silky cream cheese and pungent blue cheese but feel free to experiment with your favorite cheeses such as goat cheese, feta, Parmesan, Mozzarella or Asiago. Beat the cream cheese with an electric mixer until fluffy to ensure no lumps and to make stirring the rest of the ingredients easier. 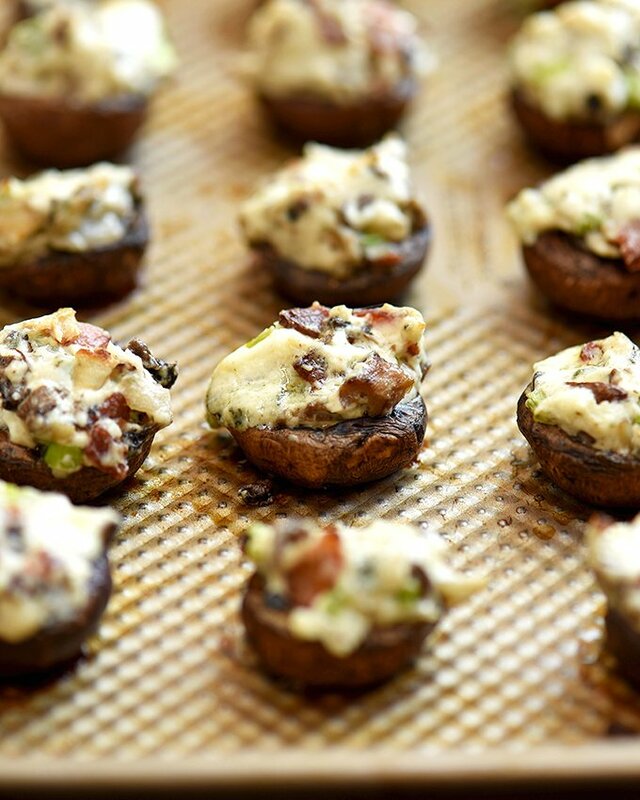 Use mushrooms as not only are they easier to stuff, they will also reduce in size when baked. 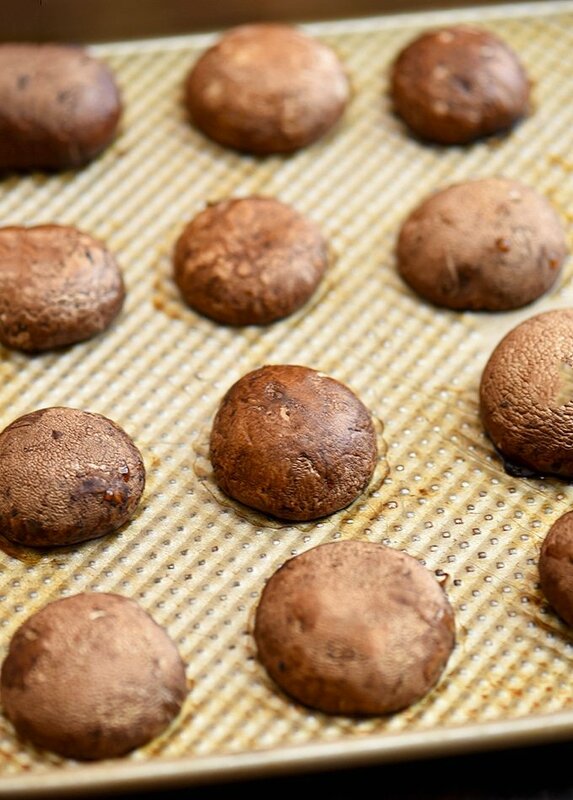 After cleaning and removing the stems, par-bake the mushrooms with gills side down before stuffing to dispel some of their natural liquid. 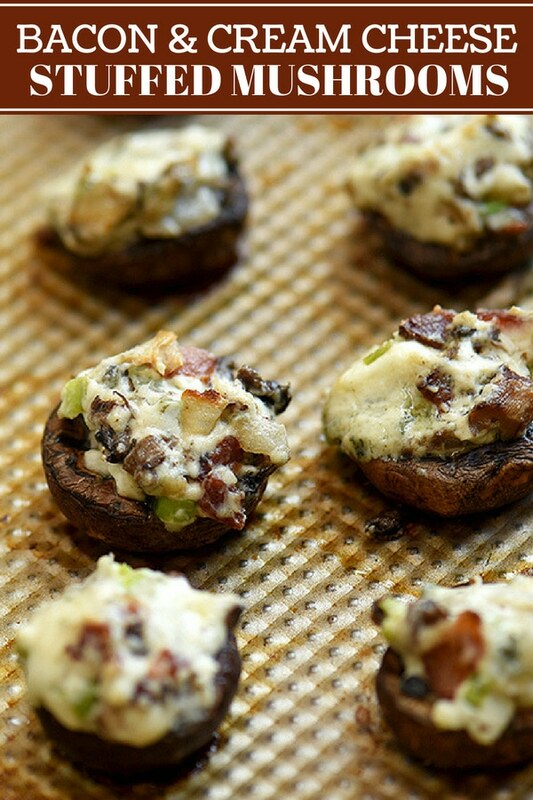 The baked mushrooms turn out less messy and watery but still moist and scrumptious. Chop up the mushroom stems and saute with shallots and onion until tender. The mixture will be used for the filling along with the cream cheese, blue cheese, crisp bacon, and green onions to add bulk and flavor. 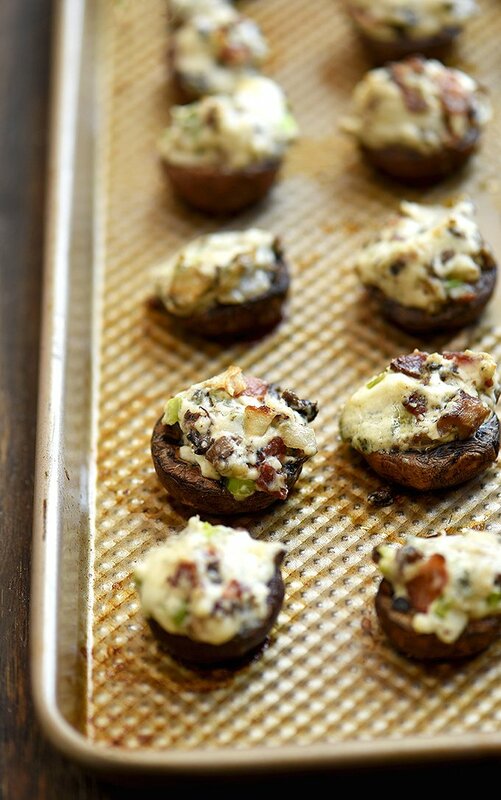 Bake on high heat so the filling will brown nicely without overcooking the mushrooms. Since I par-baked the mushrooms and the stuffing mixture is fully cooked, it should take just another 10 to 15 minutes to cook the mushrooms and to brown the top. 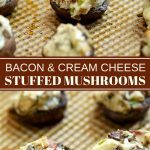 If you prefer not to par-bake, chill the filling in the freezer for a few minutes so it doesn’t melt too much while the mushrooms cook. More party food ideas? These Philly cheesesteak sliders are fun to eat and so tasty! Using a soft mushroom brush or a damp cloth, clean mushrooms to rid of any grit or dirt. Gently break off stems from caps and finely chop. In a pan over medium-high heat, cook bacon until lightly browned and crisp. Remove from heat and set aside. Remove rendered fat except for about 1 tablespoon. Add shallots and garlic to the pan and cook until softened. Add chopped mushroom stems and continue to cook, stirring regularly, for about 2 to 3 minutes or until tender. Season with salt and pepper to taste. Remove from heat and allow to cool. In a bowl, beat cream cheese until smooth and fluffy. 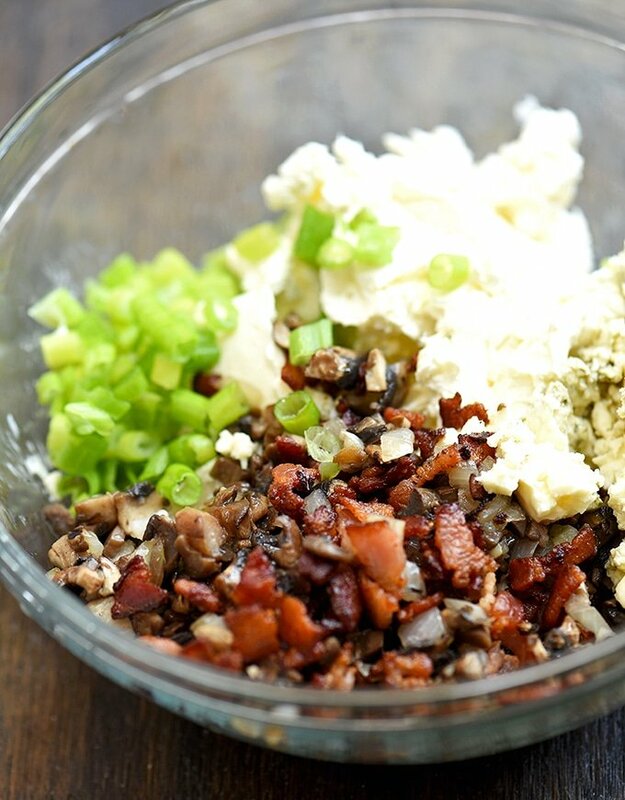 Add blue cheese, mushroom mixture, crisp bacon, and green onions. Stir to combine. Arrange mushroom caps gills side down on a baking sheet and lightly brush with olive oil. Bake in a 400 F oven for about 4 to 5 minutes or just until mushrooms start to leak. Turn mushroom caps to cavity side up and using a small spoon, fill with stuffing mixture. Return to oven and bake at 400 F for another 10 minutes or until filling is heated through and tops are golden brown. Nutritional info is calculated at about 4 pieces per serving. This recipe was awesome ! I only added some shredded cheese to the stuffing and as a garnish!! Sooo yummy!!! Thank you, Kelly, for the feedback and the tip. I’ll try it with cheese next time. Happy New Year! I also parboil my mushrooms to let them release their juices and they are always super tender. Mmm you have my mouthwatering with this recipe… thanks for sharing! Yes, you’d think this would dry out the mushrooms but it doesn’t. Thanks for visiting Shannon.